Born in Otahuhu, New Zealand in 1941, Peryer spent part of his childhood in Takanini, South Auckland before moving to the island’s far north. He studied both science and the humanities at university then spent several years teaching at primary, secondary and tertiary levels until at the age of 32 (without ever having owned a camera) he decided that photography was his vocation. Peryer has exhibited widely throughout New Zealand, Australia and internationally. Recent exhibitions include ‘The dream collectors’, Museum of New Zealand, Te Papa (1998), ‘Slow release: recent photography from New Zealand’, Heide Museum of Modern Art, Melbourne (2002), ‘New Zealand legacy: Aotearoa Taonga-tuku-iho’, (2007), and ‘A serious kind of beauty: the heroic landscape’(2010) both McNamara Gallery, Wanganui, NZ. The photography of Peter Peryer is at once direct and ambiguous, everyday and mysterious. His subjects range from the obscure to the mundane. No matter how seemingly humble the object, animal, scene or structure he records he imbues each with a strange resonating significance. Personal interests rather than elaborate theories inform his choice of subjects and range through history, science, animals, and the everyday. Childhood and adult fascinations merge in quirky ways, producing enigmatic images laced with a sense of nostalgia. Of his work Peryer has said: ‘Rather than my life being about photography, my photography is about my life…There are multiple sources, every now and then something strikes me as interesting, and sometimes they fall into particular theme areas, such as scale – that’s a big one’ [interview with Kate Davidson ‘Peter Peryer’ ‘Art on view’, summer 1995-96, p37]. 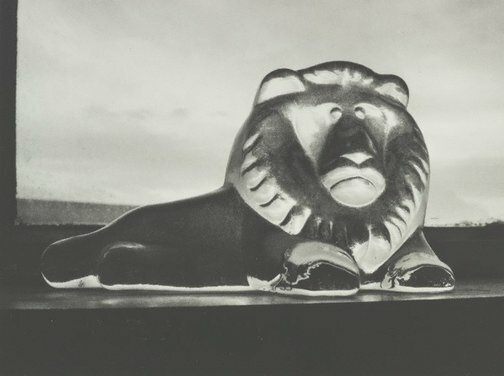 Resolutely focused on the subject with extraneous details excluded, Peryer’s photographs, such as ‘A Taranaki lion’ (2001), subtly disturb our sense of perception and provoke our imagination. Time, context and scale appear either warped or indeterminate in his images. In essence it is these qualities rather than the objects or scenes within Peryer’s photographs that are the real subject. In ‘A Taranaki lion’ the lion not only dominates the photographic image but also the landscape scene in which we perceive it sitting. Through the converging quirks of vision of photographer and viewer it is transformed from diminutive table figurine to a majestic giant of the plains - threatening yet lovable, imperial yet comical. The velvety shadows and luminous highlights provided by Peryer’s inimitable technique heighten the atmosphere of the image, creating an elusive cinematic quality, part film noir part David Lynch – pure magic. Signed and dated c.verso, pencil "... /Peter Peryer /2001 /...".